Please carefully remove all packaging before giving to a child. Suitable for all ages. Never leave a child unattended in a bath or bathroom. Always ensure the child is within its depth. Adult supervision required at all times. Some bathing products or oils may cause premature deterioration of printing inks. 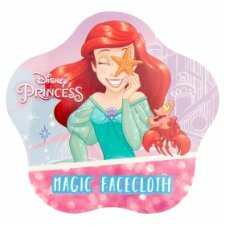 Directions for use: Place facecloth in water and watch as it magically expands. Machine washable. Rinse after use and allow to dry naturally. Please retain for future reference.